I recently got THE best birthday present everr! My sweet, sweet friend Eliza (who does all the baking and desserts for both A Tavola and The Huguenot in New Paltz, NY) taught me how to bake a damned good loaf of bread. I finally feel I can die an accomplished woman. And it's not just any loaf, but a wild fermented, completely homemade, no knead, follow-the-recipe-and-you-shall-never-fail sourdough loaf. Across many cultures the world over, bread is the sustenance of life. It's even sparked entire revolutions. It's about time I learned how to make it! To get a light, fluffy loaf with those delicious holes butter loves to melt down into, you need yeast. It makes the dough rise by transforming carbohydrates into bubbles of carbon dioxide and alcohol, which is cooked off when the bread is baked. 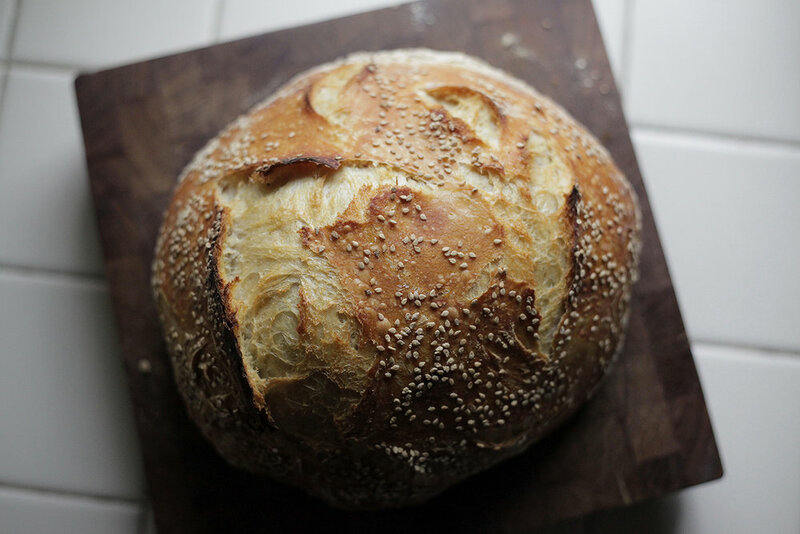 This recipe harks back to the traditional way of making bread prior to the commercial production of yeast that occurred in the late 19th century. (You couldn't always walk into a supermarket and snag a few packets of Fleischmann's dry active yeast!) Here we will harness the naturally occurring, biodiverse forms of wild yeast that surround us constantly in the air we breathe. It's everywhere, and so anyone can make this bread. All you need is flour, water and salt. It's that simple! Wild fermented sourdough bread is much healthier and easier to assimilate than most other breads. As my guru Sandor Katz says in his famed book Wild Fermentation: The Flavor, Nutrition & Craft of Live-Culture Foods, "Wild fermentation gives the dough a chance to really ferment, breaking down hard-to-digest gluten into more easily absorbed nutrients, and adding B-vitamins." Personally, I feel my body digests it very easily, where as most commercial breads weigh me down big time. To begin, you need starter. This is simply a reserve of yeasty batter, comprised solely of flour and water. A starter can last a lifetime and be passed on for generations, all the while contained in the same unwashed vessel. 1. Vigorously stir together 2 cups each of flour and non-chlorinated water (fresh spring water is best) in a large glass or ceramic jar or bowl. Feel free to add organic unwashed grapes, plums or berries to lend their chalky film of yeast (aka "bloom") to speed up the process. 2. Cover with a cheesecloth or dishtowel to allow airflow while guarding from fruit flies and critters. 3. Store your batter in a warm spot, ideally 70° - 80° F, with good air circulation. Stir your batter at least once a day with a wooden spoon to distribute the yeast evenly. 4. Once you notice tiny bubbles surfacing on your batter (not ones caused by stirring), usually after 3 or 4 days, you’re ready to start the feeding process. If this is not the case, try moving it to a warmer spot or adding a teeny bit of packaged yeast. 5. Strain out any fruit and add 1 - 2 tablespoons more flour to the batter every day for 3 days, always stirring vigorously. This will thicken your starter. You want it to have a pancake batter consistency, so add more flour or water as necessary. 6. Your starter is ready to use when it's nice and bubbly and active. If you’re an avid baker, you can leave your starter out on the counter so long as you feed it a tablespoon or 2 of flour twice a day. For the rest of us non-commitment types, store it in an airtight glass or ceramic jar in your refrigerator. This will dramatically slow the yeast's activity so it only requires feeding once a week. And if you're planning a trip, you can keep your starter unfed in the fridge for a couple weeks, or in the freezer for longer. 7. Make sure to always replenish your starter after each use! To do so, simply stir in flour and water equal to the amount you poured out. SO, let's say you used 1 cup starter to bake a loaf. You should then replenish your starter batter with 1 cup flour and 1 cup water, stirring vigorously. 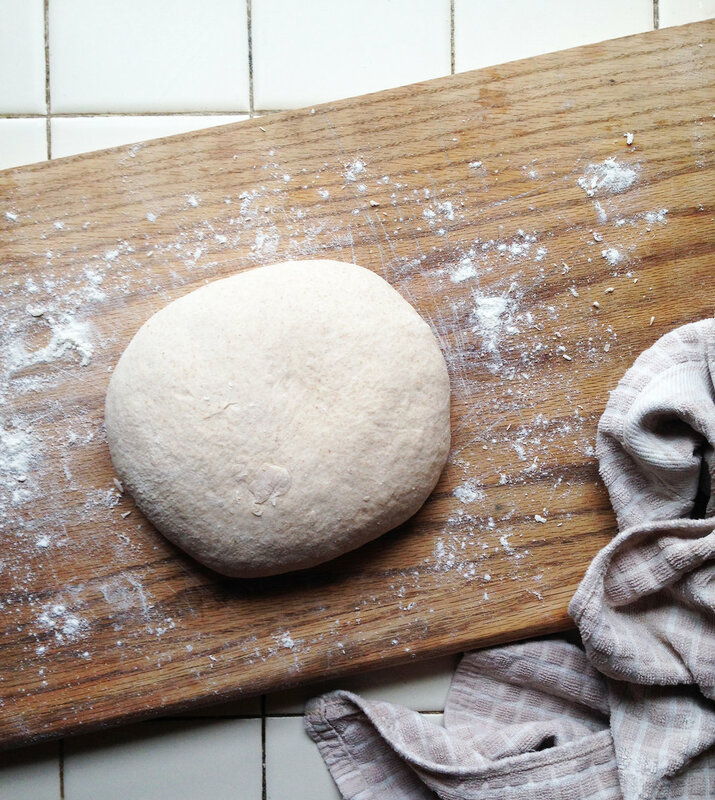 If you like a strong sourdough flavor, you can leave your replenished starter out to ferment for 4 - 8 hours after each feeding before refrigerating. Otherwise, simply replenish and refrigerate! If you’re worried that your starter is in desperate need of reviving, pour off most of its contents and replenish with plenty of fresh flour and water. What remains of the original starter on the sides of the jar is usually enough to get it going again, but a little extra dollop couldn’t hurt. Once your starter is ready, it’s time to bake. Follow the below recipe for a fool-proof loaf, each and every time! Bread flour is of course your best option, but all purpose flour is great too! I personally love King Arthur Organic Bread Flour, and sometimes substitute 1 cup of the unbleached flour for 1 cup organic sprouted whole wheat flour. 1. Pour starter into a large glass or ceramic mixing bowl. Add water and salt and stir. Dump in all your flour and stir until well combined. Consistency should be thick and porridgey. 2. Let your batter sit in its bowl covered with a dish towel (so no flies get in) overnight or for at least 8 hours. This is the first ferment. TIP: If the air in your home is hot & dry, try dampening the dish towel. 3. Time to shape your loaf! (This is the best point to add in any additional ingredients to flavor your loaf, such as roasted garlic, rosemary, olives, melted butter, or any other herb and spice combinations you can dream up, so add them in while shaping.) Scoop your batter out onto a floured surface and shape it by pulling the edges in towards the middle of your loaf, constantly rotating. If it's easier for you, simply roll between your palms (while still on the counter) into a ball. * There is no need to knead this bread! 4. Now you're ready for the second round of fermentation. You can either grease your glass or ceramic bowl with olive or coconut oil, butter, or any preferred fat, and sprinkle with cornmeal, then plop in your shaped loaf, or simply line your bowl with a lightly floured dishtowel and let it rest on top (see below photo for latter method). Cover your bowl with a lid or plate and let it sit out on your counter for 4 - 8 hours if you're available to bake it immediately. Otherwise, put it in the fridge until you're ready, for up to 2 weeks but at least for 9 hours. 5. Let's bake! Your loaf should have about doubled in size by the time you're ready to bake. Preheat your oven to 500°. Grease your dutch oven (I use cast iron, but enamelware works wonderfully as well) and preheat it for 20 minutes with the lid on to heat through. 6. Once it's preheated, carefully remove the lid (there should be plenty of steam escaping) and generously sprinkle the pan with either cornmeal or flour. Gently flip your shaped loaf into the dutch oven. Now's the time to quickly score the top or pinch and swirl the middle to create a little nubbin if you'd like. I usually just leave mine be. Quickly now! You want to put the lid back on ASAP to trap all that precious heat and steam! 7. Bake for 30 minutes with the lid on. 8. Reduce heat to 350° and bake for another 15- 18 minutes (less time = a moister loaf) without the lid. I usually pull the loaf out after 16 or 17 minutes. Just keep an eye on that top crust. 9. Let the loaf rest for at least 15 minutes before cutting into it. Your loaf should have a deliciously crusty crust and soft, moist, fluffy interior filled with gorgeous holes aplenty. Smear it with butter or coconut oil and sea salt, and use it for sandwiches, toast, and dipping. Last 2 photos captured by the ever talented Juliana Blizzard. All other photos are my own.